L'Antic Colonial continues to widen its range of creative possibilities, incorporating new mosaic collections and models to offer solutions for all types of spaces. Wall tiles that remain unaltered by the passing of time can be used indoors where a sober and elegant decoration is sought after, as well as in atmospheres where a more ground-breaking design is opted for. 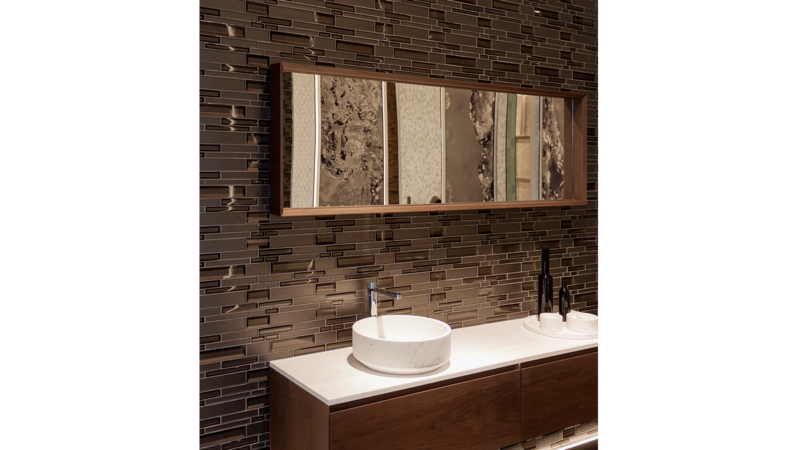 In the Mix Mosaics series, L'Antic Colonial incorporates the Savoya collection. A design which integrates both natural stone tiles and ceramic tiles, with an elongated format and rounded edges which provide high levels of uniqueness. Also, the tiles do not follow the same colour pattern, but each piece consists of different shades, which are always in the same colour range that achieves a harmonious set. The Bezel collection, from the Glass Mosaics range, has rectangular tiles in irregular sizes and finishes, whose glassy material fills any room with light and freshness. It has some translucent tiles which create a background relief which goes unnoticed. In addition, the other fractions have a matt finish that shows almost opaque pieces contrasting with the glassy elements. In this way, a distinguished style that provides an attractive composition of light and dark is achieved. Three colourful models: Glaze Wave Blue, Green and Turquoise, get to L'Antic Colonial with the intention of filling any space with energy. 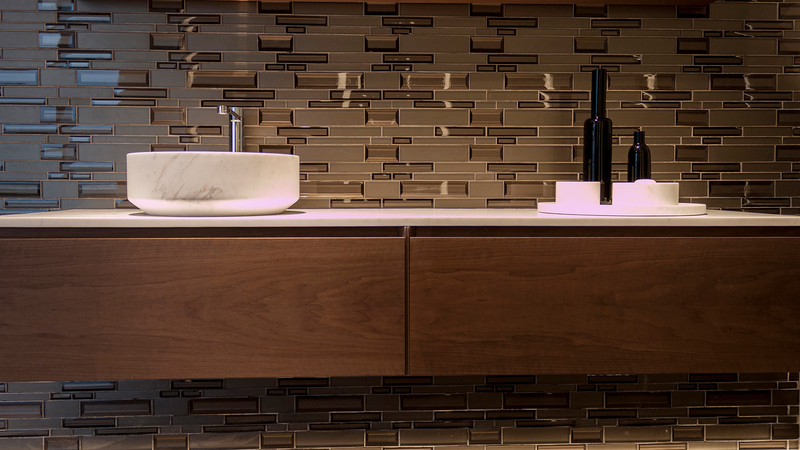 These are glass mosaics that differ from the usual in terms of colour, style and shape. Its tiles create a very original serpentine perspective that projects an uninhibiting and relaxing style. L'Antic Colonial also makes the Stone Mosaics collection bigger with two designs that stand out for their dynamism and authenticity. 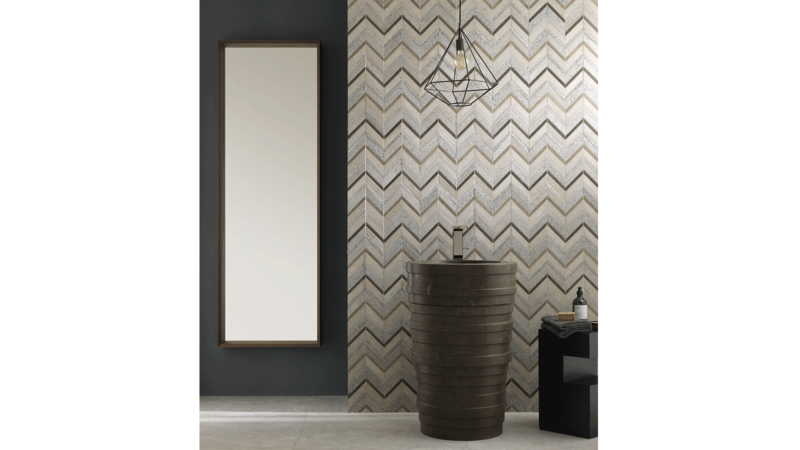 World Amsterdam Chevron Gray designs its tiles diagonally, creating a chevron-like or arrowhead mosaic style. For its part, World Amsterdam Diamond Gray intersperses rhombuses with other rhomboid tiles creating diamond-like shapes. 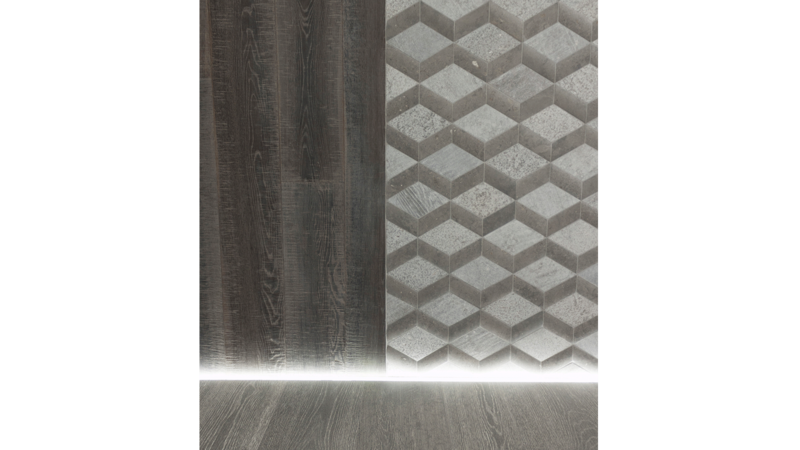 Both designs have tiles with a slightly irregular texture to the touch because of the porosity of the natural stone itself. Finally, this firm makes the Stone Mosaics Essential collection bigger with new models consisting of both rectangular, elongated, smooth and polished tiles with a pattern, like hexagonal with a rough touch and a matt finish. While Essential Net Carrara consists of whitish shades that turn grayish in the parts that have more patterns; Essential Net Silver Wood presents a cream colour range capable of transforming any atmosphere.